We love beer here at FBC - we have a whole team of beer writers who showcase Canada's flourishing Craft Beer Scene 3 times a month. But what about cooking with beer? It's becoming more and more popular and there are so many creative ways to get inspired - from cocktails to veggies, stews, breads and yes, even dessert. Here are some of our current favourite beer inspired recipes. And be sure to check out 12 more of our favourite beer recipes! So cheers! It's 5 0'clock somewhere! **[The Boston Wallbanger](http://www.melissahartfiel.com/2014/01/27/the-boston-wallbanger-and-other-beer-cocktails/)** from** Eyes Bigger Than My Stomach**. **[Rhubarb and Beer BBQ Sauce](http://myislandbistrokitchen.com/2016/06/26/rhubarb-beer-barbeque-sauce/)** from **My Island Bistro Kitchen**. 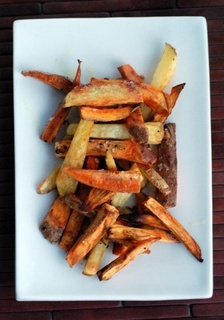 **[Crispy Beer-Soaked Sweet Potato Fries](https://tastespace.wordpress.com/2013/03/08/crispy-beer-soaked-sweet-potato-fries/)** from **The Taste Space**. **[Smoky Mac and Cheese](http://theyumyumfactor.blogspot.ca/2016/04/smoky-mac-and-cheese-in-instant-pot.html)** from **The Yum Yum Factor**. **[Carne Asada Borracha](http://www.diversivore.com/recipe/carne-asada-borracha/)** from **Diversivore**. **[Stout Beer Bread](https://vanfoodies.com/2016/02/26/recipe-stout-beer-bread/)** from **VanFoodies**. **[Guinness Beef Stew](http://www.therusticwife.com/#!Guinness-Beef-Stew/c1v05/56e9e46a0cf282fc9b01107c)** from **The Rustic Wife**. **[Nightshade Free Guinness Cottage Pie](http://isaynomato.com/nightshade-free-guinness-cottage-pie/)** from **I Say Nomato**. A big thank you to all our FBC Members who participated in this weekend's beer recipe roundup. Thanks for including my beer-braised ribs among such talented company! It’s great to see so many recipes featuring beer gathered together; clearly, beer could be the theme for an entire feast! Thanks for including my french onion soup. It’s an old post and I don’t love the photography but the recipe was awesome. All of these beer recipes look delicious!